Madrasi is your city guide to Chennai India. There is no dearth of home furnishing outlets in Chennai. Based on your budget, you can shop for home furnishings at upscale malls or small specialist shops. This page offers insight to the choice of Home Furnishing in India. Home furnishings, if properly chosen and blended with care can do wonders in creating the dream home. Choosing home furnishings may seem to be a daunting task but only till one decides what to consider essential for a home. Furnishing a home need not be as expensive an affair as one might think. With smart and coordinated planning, with a hint of creativity one can create a distinctive look. First and foremost, decide on the fabric texture, colour and style that would suit the home interior. Choose the style, whether casual, modern or traditional. There are plenty of interior decor catalogs that help to choose the suitable style. While choosing the fabric colours, keep in mind the other colours in the room. Decide on the budget before embarking on the purchase. Home should reflect the personality of the inhabitants; hence themes, styles and preferences should essentially be individualistic. The range of home furnishings include curtains, cushions, drapes, wall coverings and hangings, bed covers and table cloths. This is an essential decorative item that goes to enhance the beauty and set the right ambience for home decor. Stylish, attractive and clean curtains create a tremendous impact. Curtains are also a source of privacy. 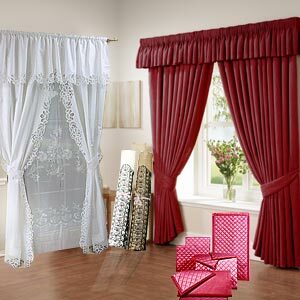 Curtains come in a wide range of material and motifs. They can be put to use in the drawing room, bed room or bathroom. Materials for curtain could be linen, cotton, silk, satin or net. Motifs and prints of the curtain should be coordinated with the other items in the room. It is also imperative that curtain rods are carefully selected to enhance the overall look of the room. In Chennai, curtains for luxury furnishings, elegant, exclusive and of course, expensive can be bought from a variety of places. Atmosphere in Khader Nawaz Khan Road is one such showroom for designer curtains in a wide variety of fabrics. Fabindia, situated in Spencer Plaza Phase II boasts of a comprehensive range of furnishings for bed, bath and kitchen including curtains. Fabric World at Annanagar is the place to go for both inexpensive as well as delicately expensive furnishings. The range is large and you can avail easy parking facility. For seekers of readymade curtains, as well as materials that range from plain cottons to raw silk and lace, the exclusive curtains by Rastogis are available at T.Nagar. Go at leisure to take your pick among the huge stock available at your disposal. Several road side peddlers selling curtains can be found in Cotton Street at the Pantheon road or near the Rajaji Bhavan at Besant Nagar for comfortably bargains. As its very name suggests, cushion signify comfort and warmth. This means, in essence, cushions should be soft and durable. Cushions could be in various shapes and sizes, square, rectangular or circle. Nowadays they come in a gamut of geometric sizes including the heart shapes ones and anything that can swindle one's imagination. The size of the cushion depends upon the sitting area - be it furniture or bed. Cushions come made in cool cottons or synthetic materials that are easy of maintenance. Mega malls like Citi Centre, Spencers or Lifestyle sell stylish cushions which are pretty expensive. Kalpa Druma situated across Chola Sheraton on the Cathedral road features home textiles, furnishings and handicrafts. The variety and quality of home furnishings is superb here and one can feast your eyes on distinct handicrafts and home decor from various parts of the country. The glitter and shimmer of cushion covers, handcrafted table mats and other figurines are astonishing at Kalpa Druma. The resplendent home furnishings leave one spoilt for choice. Apart from the primary use of table cloths as important to maintain table tops, a trendy table cloth compliments the look of a dining area. Water proof table cloths with plastic lining that protects the wooden table tops are of practical use. George Town is one wholesale area in Chennai city where any kind of home furnishing can be found. Table cloths in many a fabric with embroidery prints, lace worked ones and stunningly printed designs can be purchased here. There are several shops at Pondy Bazaar in T.Nagar which display an array of table cloth in different fabric options. You can also source table cloth and other kitchen linen from Spencer Plaza at Anna Salai. As the very name indicates, bed covers cover the bed, pillows and bed sheets throughout the day. Bed covers are not just crucial factors for maintaining personal hygiene but they add elegance and beauty to the bedroom. While satin and silk covers give a rich look to the room, a cool cotton bed cover are the ideal choice to combat the summer heat. While pillows are purely functional lending soft support for the head, pillows used on a couch or a chair could be decorative and designed to enhance home decor. Made from a wide variety of materials, these covers are available in different sizes and styles. Bed and pillow covers can be procured very easily in any home decor shop. In this context, one can visit Co-optex, the Tamilnadu Handloom Weaver's Cooperative Society, established as early as 1935. Co-optex is steeped in a rich timeless tradition of handloom. The name is synonymous with quality, durability and economy. The Co-optex home furnishing range includes bed spreads, pillow covers, curtains, carpets, furnishing fabrics and kitchen linens, table mats and towels. In Chennai, prominent Co-optex showrooms are located at Pantheon Road, Egmore, Annasalai, Purasawalkam high road, T.Nagar, Adayar, Mylapore, Koyambedu and Perambur. Rugs and carpets are used in living and bedrooms. While lightweight carpets and durries come in numerous styles, pile carpets from Kashmir base their skillful designs on the Persian and Asian features. The Kashmiri Emporium at Anna salai in Chennai stocks Namdas, Hook rugs and Gabbas made of felted wool and cotton and embroidered with woollen chain stitches. The appliqué work done is attractive. There are several make-shift Rajasthani emporiums in Chennai that house fine quality patterns of rugs and carpets in red, ivory, green and black background hues. These are quality carpets with geometric patterns of around 30 to 60 knots per square inch. For the cosmopolitan tourist, shops like M.A. Jacob carpets; opposite Stella Maris College on the Cathedral road is an ideal treasure hunt. For eco-friendly, dyed and easily washable carpets and rugs, visit Indo Persian Carpets and Rugs in Parsn Apartments, Alwarpet. The shop is purse friendly with unmatched range in deep mauve, brown, soft pink and orange combinations. Special effect can be produced in a room with appropriate wall coverings. Exind is a place in Cathedral road opposite hotel Chola Sheraton that provides exquisite Indian hand woven textiles and handicrafts. The Cottage Industries Exposition opposite Taj Coromandel hotel is a leading emporium of handicrafts in the city with its exclusive wall coverings, although they are pretty expensive. While Srishti in Anderson road deals with exotic handicraft items in cane, bamboo, jute and pine, Artisan's in Anna Salai, Thofah in Egmore, Gurjari in Nungambakkam, and Khadi Gramodyog Bhavan at the Anna Salai sell simply handicrafts, all reasonably priced. Chennai is a sure shopper's delight and has some great places to offer for the indulgent. Bargaining for prices can be done in almost all places except in certain branded cosmopolitan shops with a fixed price tag. Government Emporiums offer a wide variety of choice in home furnishing competing with private retailers displaying their wares in air conditioned comfort. Spencer Plaza in Anna Salai, Shoppers Stop in Harrington road and Globus in Pondy Bazaar or GeeGee Emerald Plaza in MG road scream of home decor items for a whooping price; while the traders in Pondy Bazaar, Ranganathan street or Purasawalkam Tank road sells comfortable cotton and linen furnishings, so well suited to the steaming hot Chennai weather for a cool cool price! !